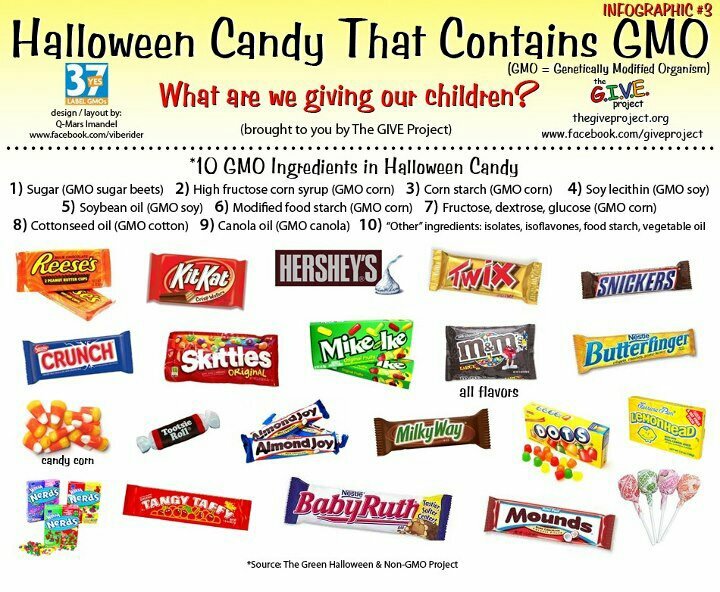 I love Halloween and I loved it a lot more before I found out that pretty much all the popular Halloween candy has been genetically modified. Really, I mean what the hell are we doing to the children? I am wondering what would be a good alternative is for this candy. Any ideas? I know the very least we can do is vote for labeling. 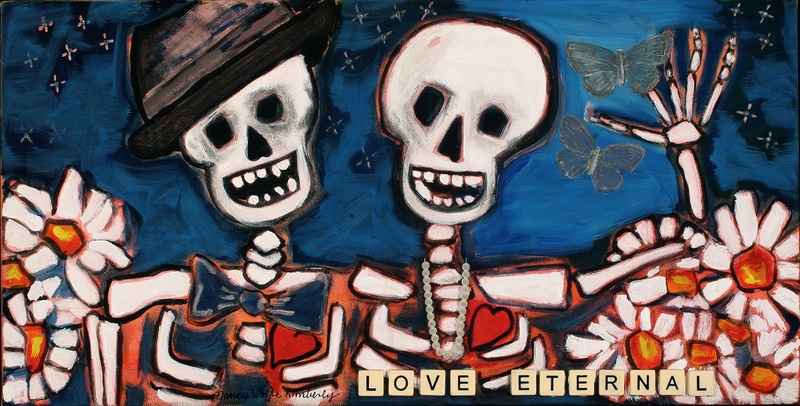 What I love more than Halloween is Dia de los Muertos. It makes all kind of sense to me to remember and honor those who passed on. Good and bad, they gave us everything. I am celebrating Thursday, November 1 through Friday, November 2, by cooking some food I think they will like and doing things they would enjoy. I will think about impermanence and what matters in this one wild and precious life. So far this year, I have put up pictures of people I know. I will be adding more photos. This is the picture I found where my mom and I were happy. I put some buttons, beadwork and my mother’s thimble in front of the picture. I think the buttons are extra buttons from when she sewed 100 pearl buttons on my sister’s wedding dress. I put mom’s picture near a childhood picture of her mother. This is my mom’s first year on the altar. My dad is easy, because I feel connected to him. 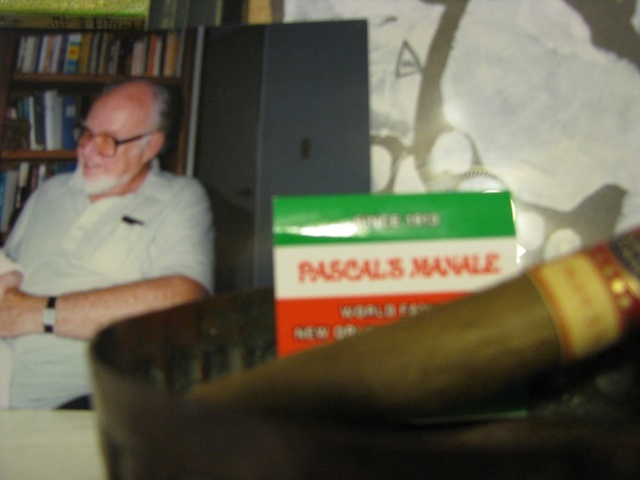 In front of dad is a cuban cigar, his ashtray, and matches from a local restaurant I think he would like. I have to refrain from putting out pastries and chocolate because for me it would be like putting crack on the altar. 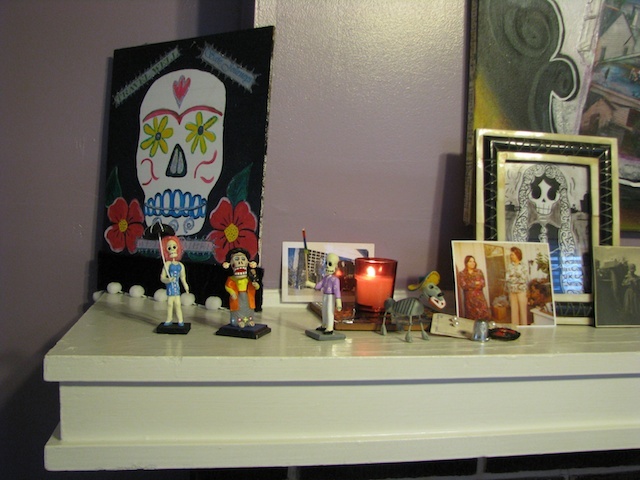 This altar is always in my bedroom. 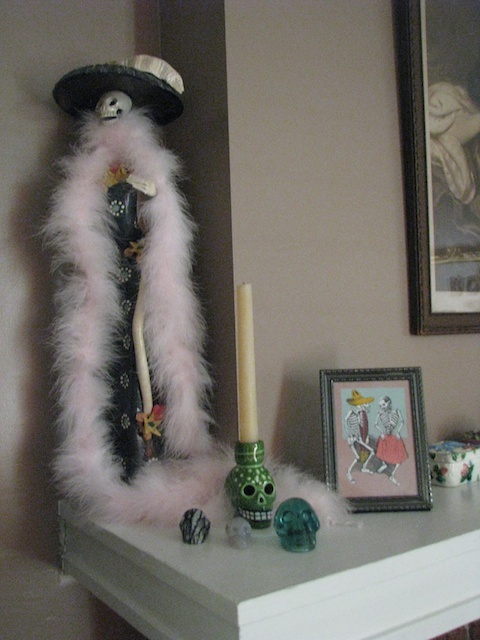 I dressed up the skeleton woman in a pink boa for Halloween. I keep her on my bedroom mantle for safety. Away from little hands. Another intriguing part of this celebration is the idea that the veil between worlds thins at this time and makes communication easier with the departed. I’m just going to stay open to it. My everyday altar to the Blessed Mother. 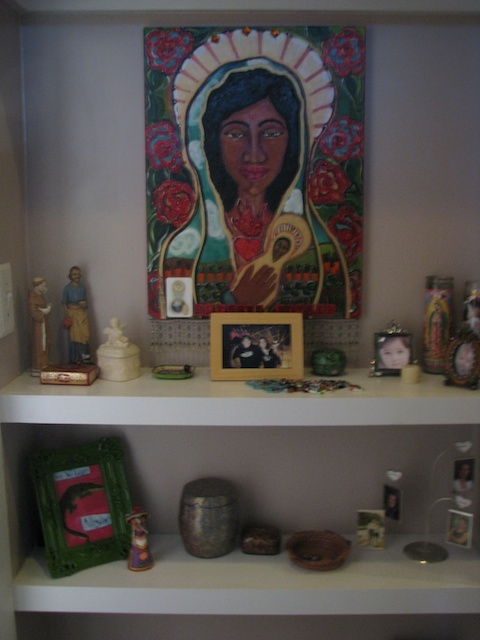 My son-in-law, Christian, built the shelves for this altar in the hallway for me. He was building a closet in the bedroom and left room for a painting and shelves in the hall. I love the location because I can give my respect all through the day. The altar doesn’t change a lot. I burn incense and keep it dust free. Mostly I practice gratitude. I would love to know if you have similar rituals, pictures of your altar, whatever you want to share. We are starting the festival season here in New Orleans. There are many things to do every weekend from now until after Mardi Gras. This weekend I am lucky enough to have art in 2 locations. 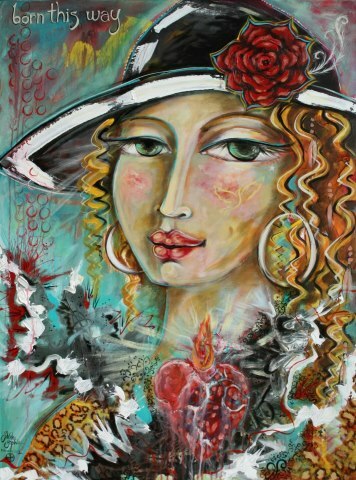 Mr. Mario Padilla has invited my painting “Fly” of Frida Kahlo to be in his show. I am definitely not going to miss this next year. I dropped Frida off while they were setting up last night. The Healing Center looked amazing. Really great art and music. I hear there will be a parade. Miss Mandie from Downtown Chic Salon has invited me to share 10 paintings at Fall for Art. I feel so fortunate and grateful for double invitations. 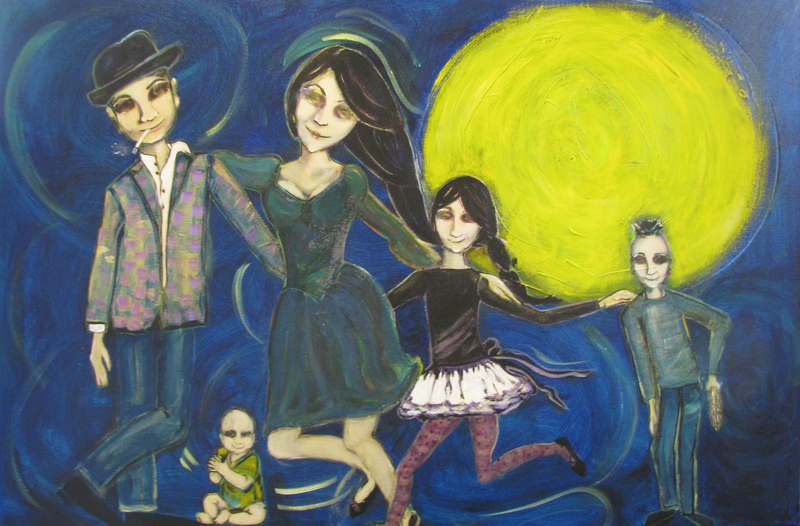 I finished Dancing in the Moonlight (alternately The Happy Family). I like the family. They look like New Orleans to me. I decided against button eyes and their mouths sewn shut. With the baby in the picture, it was going to look too gruesome. I just wanted them to look recently departed and back for a visit.I probably decided to paint them because of the Fall weather and Day of the Dead being just a couple of weeks away. They are wearing many of the same colors as the night sky. You can see that the children inherited their mother’s chin. It was fun to see the family resemblances. I secretly have always liked the mother to pass down the genes. Maggie wants another baby in their family in real life, so she asked me to paint a baby in the picture. Dia de los Muertos is one of my favorite days. I spend time honoring and remembering loved ones that have passed over. 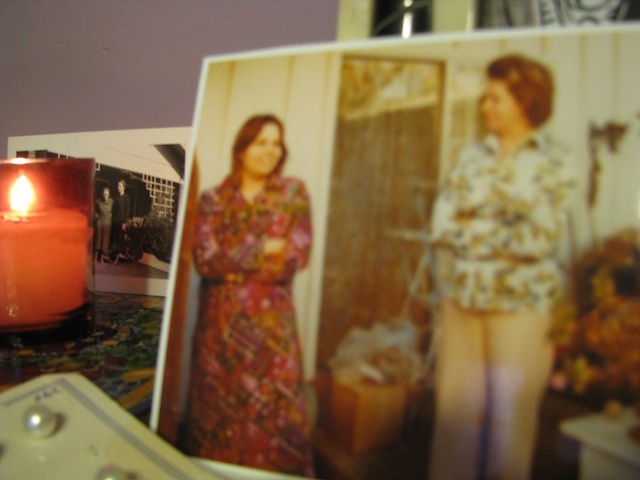 I have a box of photos I look through that I have collected and pick a few for the altar. I don’t put everyone up because I would be too crowded, but looking through the pictures is part of the honoring and I think the departed understand. My mom and I had a shaky relationship. She passed on several years ago. I recently found a picture of the two of us enjoying time together. I am going to see if I like having the picture up in our house. Sometimes it takes a long time for forgiveness and understanding. At least for me it does. It turns out the altar is healing as well as honoring. Wishing you healing and a lovely Fall. It is Saturday, the last day I allow myself to blog. I don’t know why the procrastination. I am also procrastinating finishing Dancing in the Moonlight. I am enjoying the family so much that I don’t want it to be over. I also call it Happy Family, but that is not the real name. I was going to sew buttons on for eyes and sew their mouths shut with embroidery thread in a cross-stitch. I am not going to do that now, because I think they would look too scary. I want the family obviously visiting from the other side, but not scary. I did put the cosmetic bag material on the mother’s dress and daughter’s tights. You can’t really tell, except for the shimmer and it feels lovely to touch. The moon has glow-in-the-dark paint as the last coat. Awesome with the lights off. Right now, my favorite people to paint are recently dead. I like the colors better than skeletons or the living. With that in mind, it is odd that my next painting will have dragonfly wings. My daughter and my daughter’s sister-in-law (let’s just call them Katy and Antonia) went to the Green Project and saw a lot of broken glass. They put it in a bag thinking I could make a snoball painting with it. How sweet of them. Some of the glass is from a car wreck and looks just like dragonfly wings. I am looking forward to trying it out. We are having a little trouble decorating for Halloween this year. Maggie and Raffi don’t like anything scary. Maggie says when she has a Halloween store, she will only have unicorns and puppies. She has asked me so many times to change the hand that scares her in the candy bowl so it will give the candy instead of grabbing the hand that reaches in the bowl. Finally, I get that they don’t want to be scared. This is the bowl that I am talking about. I told Maggie that I had an idea. 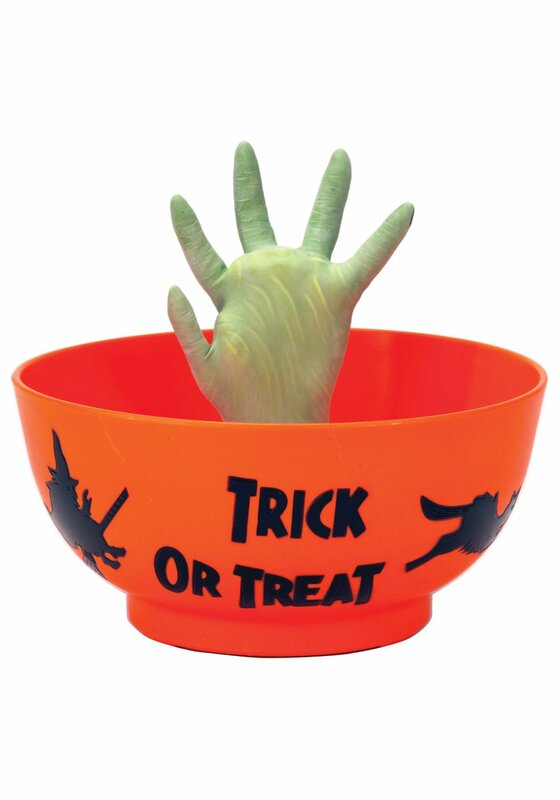 When the little kids come to the door, I will hand them some candy with my hand. She said that is a great idea. I need to write 2 distinct blogs on this beautiful day in October. I have been consciously putting off adding Shiloh Sophia to my list of Artists I Adore. I don’t believe I can do her justice. Today, I decided to offer my best and that will be enough. Shiloh changed my life. She helped be to discover my dream and gave me the tools to get there. Shiloh is the founder of Cosmic Cowgirls. The idea came to her when she was just a girl. She has always wanted to empower and connect women. One thing that I remember vividly is when she needed two other women to help her run her growing business, she painted 3 women standing together. The perfect women showed up in the perfect time. 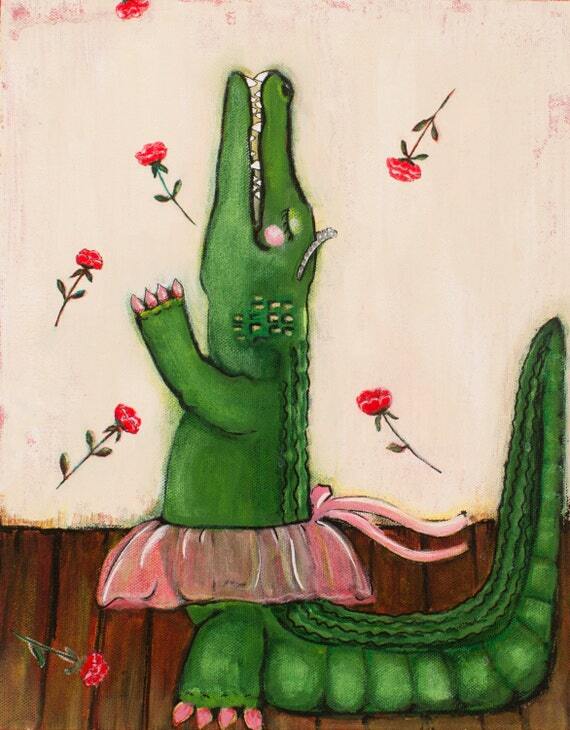 When I wanted to move to New Orleans, I started painting alligators. Alligators were all I wanted to paint for 2 years. To me alligators were the symbol and the means to adventure. One of the classes I took with Shiloh was called Leading a Legendary Life. It was a 6 month Internet course that we begged Shiloh to continue for a year. In that course, we painted the 4 directions of our life. My Southern direction was Louisiana, being an Artist and living in New Orleans. My Northern direction were my Roots and my desire to stay connected to my family. Eastern was health. In the East, I was led to a group where I released 100 pounds. My Western direction turned into Vacation and Travel as California would no longer be my home. All of the canvases came to life. Since this is a blog and not a book, I will let you follow Shiloh’s link to learn more. 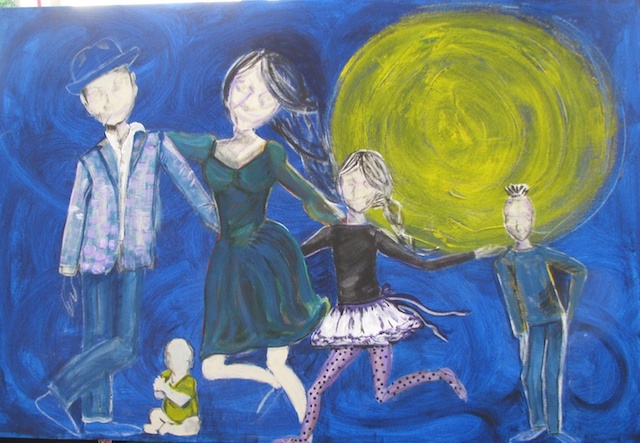 I am painting a family from the other side of life. The happy family is dancing in the moonlight. I love celebrating Dio De Los Muertos, the Day of the Dead. I will include a picture of my altar at the end of the month. I am taking an online class from Jane Davenport. I am feeling more confident painting bodies. I am also trying some new techniques. I rolled a thick coat of Liquitex Professional Heavy Body Phthalocyanine Blue over the whole canvas. Next, I brushed in swirls. The moon is painted on dry gel medium applied with a motel key card. Swiping the card made some nice grooves. For the girl’s tights, I used a trick I learned on Pinterest. I put a nail in the eraser part of a pencil and used the head of the nail to make black polka dots. I am going to apply a shiny fabric, that used to be a gift bag for bath products, over the mother’s dress and the girls tights using acrylic varnish. I think the fabric will seem a little other worldly and add some shine and movement. I am going to say good-bye now. I trust that if you need Shiloh in your life, you will find her. She is a genius for helping you to realize your dreams. If you have your dream, carry it, nurture it, speak it, do something towards it every day.